The SF 123-T Thermostatic shower valve is no longer available. 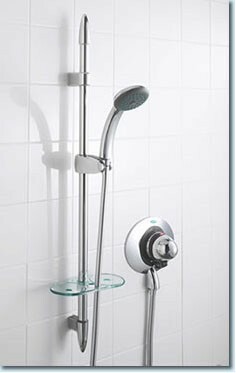 The SL5 thermostatic shower valve is a great unit for replacement. The New SL5 Recessed Round Shower Valve, a great option for replacing your old SF 123-T thermostatic shower valve. IMPORTANT: Pipe centers for the old SF 123-T were 150mm the SL5 pipe centers are 130mm - 150mm. Please note the location of the outlet elbow is different between these 2 showers, the SL5 shower requires a seperate wall outlet elbow so some alteration is required.